Call of Duty: Black Ops 4 receives another huge content update today, as its battle royale mode Blackout goes free to play for a month to celebrate the release of another map for the high concept PvP mode. Alcatraz, the famous island prison situated in the San Francisco bay, has previously been the inspiration for several Call of Duty Zombies maps for developer Treyarch, but the studio has deigned it as the next setting for Blackout, describing it in the trailer below as the backdrop for "Close Quarters Battle Royale." 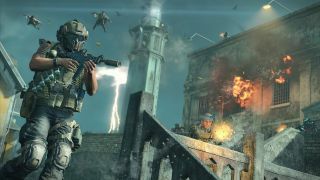 As that moniker implies, Alcatraz is much smaller than the first, unnamed Black Ops 4 Blackout map, and the trailer seems to suggest that Treyarch's "Down But Not Out" match mode (in which squad mates can respawn so long as one member of their team is still alive) will be the dominant game type for this free addition to the Blackout arsenal. Black Ops 4's battle royale will also feature new additions such as more cosmetic outfits and the flamethrower weapon, but Alcatraz itself will be arriving as a free update to the PS4 version of the game first (starting today), before hitting PC and Xbox One at a later date. In more good news, Blackout will also be free to play to anyone between April 2 - 30, which marks almost an entire month of unpaid battle royale. All you need to do is download the game on your platform of choice (and subscribe to PS Plus or Xbox Live on console), and you'll be good to go. Find out where Black Ops 4 lands in our list of the best Call of Duty games of all time, or watch our Black Ops 4 Blackout tips below to help you dominate its battle royale.